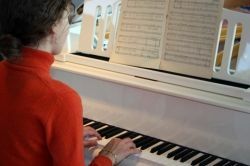 What Makes Piano Worship Chords Special? 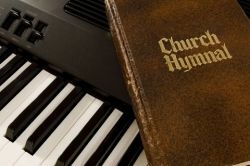 Piano worship chords aren’t very much different from the chords found in other types of music – pop, jazz, country, etc. – but they do have a certain sound to them that’s a bit difficult to explain. So, instead of talking too much about it, we’re going to look at two different chord progressions that should help you to create some improvised background music or figure out some nice chords for your favorite worship music. How Do I Play Background Piano Worship Music? Let’s say you need a quick couple of minutes of music during a service or ceremony, where something is happening quietly, or quiet blessings are taking place, and you either feel the need for some music, or you’ve been asked beforehand to fill in a little bit at certain times. – Keep playing the C octaves in your left hand the entire time. The C “pedal point” in this progression helps keep the sound anchored and provides a strong, solid foundation for your listeners (whether they know it or not!). Of course, this can be played in any key as well. What’s Your Biggest Need For Piano Worship Music? Sometimes we have all the music we need for religious services, but other times we need to a little extra worship music. When Do You Most Often Need Fresh Ideas For Piano Worship Music? All the time – I need help with all the music! What Piano Chords Make That “Gospel” Sound? The next chord progression might be a little too much movement for background music, but that’s really up to you do decide. The chords could be used for a new hymn you write, or just to improvise. Be sure to keep the chord notes as close to each other as possible, when moving from one chord to the next. This makes for nice voice leading and a more pleasing sound overall. The main characteristics of this second progression are the movement from major to 7th (C to C7), from major to minor (F to Fm), and using 7ths to move back to the original key (D7 – G7 – C). Practice in your sacred space when no one else is around, to get in the right mood. IF THIS POST WAS BENEFICIAL PLEASE HIT THE LIKE AND SHARE BUTTON.